Eureka, CA (August 16, 2018) – After a near month long break racing returns to Redwood Acres Raceway this Saturday night. Anderson Logging will be presenting the annual Driver Appreciation night at the 3/8-mile paved oval. With the 2018 season quickly coming to an end and championships on the line, fans should not expect anything less in every race in all of the Acres’ divisions. Saturday night will be bittersweet for many drivers, crew members and fans as it will be the first race at RAR since the passing of Paul Peeples, Sr. Peeples was a fixture on the track and in the pits at Redwood Acres Raceway for well over 40 years, going back to the days the speedway was a dirt track. In recent years, Peeples was crew chief of his son Paul Peeples, Jr.’s Thunder Roadster. In his honor, the roadsters will be racing this weekend for the first and only time in 2018. Prior to the start of Saturday night’s event, all drivers in the Thunder Roadster division will make a memorial lap in memory of Peeples. It appears as though Nick Ford’s hold on the championship points lead in the Compass Community Credit Union roadrunners is very firm. He leads second place Lindsey Zito by 68 points. Tim Ratzlaff has been Ford’s biggest competition all year long and is third in points. Misfortune prevented him from starting several races which has likely prevented him from being neck-and-neck with Ford in points. His 73-point deficit to the leader is likely insurmountable. Two rookies round out the top five in Amanda Lohr and Ronny Crump. Only one point separates the two but unfortunately, they are well out of the running for the track championship. Only three points separate first and second in the Bandolero division. Lane Anderson holds the lead but Aiden Kimberling has been consistent all year long and is second. Kadence Mace is third in the standings, 47 points behind Anderson. Malessa Miles sits fourth and 15 points behind Mace. Fifth place is Trey Daniels. Chris Lawrence has been on point since the 2018 season started at the Acres. His numerous victories and consistent up-front runs have garnered him a 48-point advantage over Tyler Peach. Aiden Daniels has been very impressive in his rookie effort and he is third in the points. Katina Baker is also new to the Legends division at RAR and she is fourth, 20-points behind Daniels. Brent Mack is fifth and only a point behind Baker. Jim Redd has been the points leader in the Fortuna Wheel & Brake bomber division almost literally since the year started. Second place Wyatt Roach had a late start to his season and has done everything possible to chip away at Redd’s lead. The gap between the two going into this weekend is 48 points. Sam Brown has been able to settle into the bomber division this year and has a third place in the standings for his effort. Division veteran Ryan Walters holds the fourth slot with Chris Naughton in fifth. The fight for the Humboldt Hydroponics Mini Stock title features an oddity in the standings. Brian Murrell, Sr. has a 32-point lead over Eugene Palmer, a gap that is almost unheard of in the highly competitive division. Scott Taylor is always one of the top drivers to beat in his second year in the division and even though he’s still looking for his first feature win, he still has an outside chance at the championship as he is 49 points behind Murrell, Sr. Trevor Eacret won his first main earlier this season and is fourth but out of the running for the title. Nick Ford has the fifth position in his possession. This weekend’s mini stock feature will be the Fifth Annual running of the Murrell 500. The winner of the 25-lap race will earn the perpetual Murrell 500 trophy. Brett Murrell is the current Murrell 500 champion having won the 2017 running of the event. In spite of Mic Moulton’s dominance in the Mid-City Motor World Super Six Challenge Series late model division, his lead over second place David Henderson is a close 12 points. Dane Nissen as been a front-runner all season long. Unfortunately for Nissen, he was unable to compete in the June 9th event otherwise his 66-point deficit to Moulton would be much closer. Kenny Demello is 97 points behind Moulton in fourth. Marty Walsh is fifth, 101 points behind the leader. Before the racing action starts on Saturday’s Driver Appreciation Night, fans will be able to make their way onto the front straight to meet their favorite drivers and get an up-close look at all of the race cars in all of the divisions. The grandstands will open at 5:00 PM with the meet and greet starting at the same time. Fans will have over an hour to interact with their local short-track heroes as racing will begin at 6:30 PM. RAR will also be hosting a donation drive for those who have been affected by the devastating Carr and Mendocino Complex fires. Fans who make a $10 donation will receive a complimentary ticket good for admission to the season-ending Fall Spectacular on Saturday September 8th. Eureka, CA (August 14, 2018) – Redwood Acres Raceway is proud to announce a special new staff member who will be using his talents to provide insight from a unique point of view. 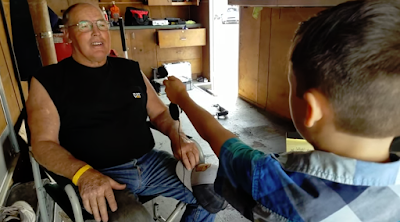 Seven-year-old Jacob Lawrence, who will be eight in the beginning of September, will be RAR’s new Junior Ace Video Reporter for the final two races of the 2018 season and into the future. With his own initiative and the help of his family, Jacob started his own YouTube channel JacobsTV in July. Jacob interviewed several drivers during the most recent race on July 21st and also interacted with drivers in the Malicious Monster Truck Insanity Tour earlier this month. Jacob’s interviews quickly became a big hit amongst drivers and fans thanks to his enthusiasm and creativity. His perspective will give fans of all ages a chance to view the drivers and the races at Redwood Acres Raceway from a new and unique point of view. Jacob’s passion for motorsports was inherited through his family. His father, Michael, better known to local race fans as Cheeseburger, raced at Redwood Acres Raceway for several years. 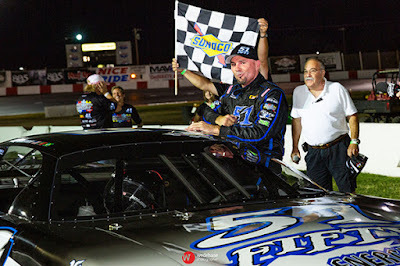 Lawrence won the 2012 championship in the Roadrunner division and another track championship in the Bomber division in 2013. His two track titles, in two different divisions, puts his name alongside Randy Olson, Rusty Olson, Glenn Shewry, Mic Moulton, Otis Stabler and Paul Peeples, Jr. as the only drivers who’ve been able to do so since the Acres was paved in 1988. BAKERSFIELD, CALIFORNIA (August 14, 2018) – For the eighth year, Racing for Wishes will compete at Bakersfield Speedway with dirt track action for a great cause. 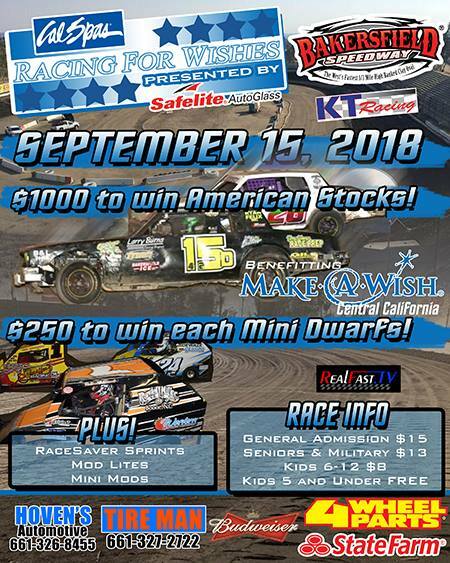 On September 15th, race fans will be treated to a $1000 to win American Stocks feature and $250 to win each Mini Dwarf main event. Racing for Wishes raises funds for Make-A-Wish children who are battling serious medical conditions. “Pass the helmet”, a silent auction, and sponsorship support aides in the fundraising efforts with 100% of the monies donated to the Make-A-Wish Foundation. Make-A-Wish Central California grants the wishes of children with life-threatening medical conditions to enrich the human experience with hope, strength, and joy. Last year, 30 Kern County kids were granted their one true wish and the foundation is expected to increase that number next year. Bakersfield Speedway and the Schwietzer Family are avid supporter of charities in our community. They started Racing for Wishes in 2010 to offer their support. In addition to the strong first place prizes, the American Stock event will also offer $500 for second and $250 for third as well. Mini Dwarfs in both the Jr. and Sr. divisions will see $100 for second and $50 for third. Western RaceSaver Sprints, Mod Lites, and Mini Mods will also be in action. Racing for Wishes VIII has major support from Cal Spas and Safelite Auto Glass. Holder’s Air Conditioning, California Aeronautical University, Hoven’s Automotive, Tire Man, 4 Wheel Parts, State Farm, KT Racing, and RealFast.TV are also presenting the event. Bakersfield Speedway is located at 5001 N. Chester in Bakersfield, CA and is a one-third mile dirt oval. Adult tickets are just $15 with seniors and military $13, kids 6-12 $8, and kids 5 and under are FREE. Grandstands open at 4 p.m. with racing beginning at 6 p.m. Parking is free as well. CLOVIS, CALIFORNIA (August 13, 2018) – 16 year-old Austin Herzog, the 2018 RPM Mortgage Pro Late Model Series points leader, has announced a pair of Super Late Model races on his post-season schedule. Herzog and his Austin Herzog Motorsports team, led by crew chief Charlie Wilson, have targeted the Fall Classic at Las Vegas in October and the 2019 Winter Showdown at Kern County Raceway next February. 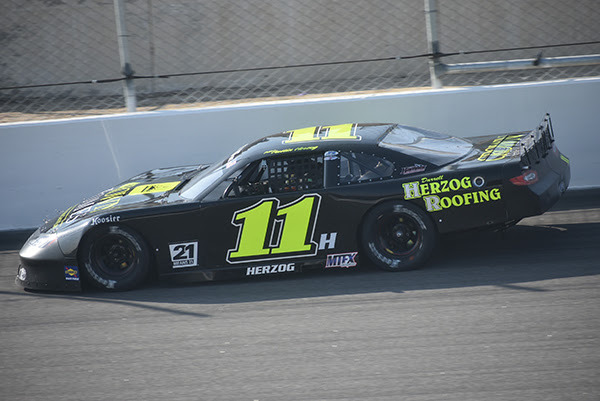 Herzog has had success in both events, notably qualifying third out of a prestigious field of Super Late Models in last year’s visit to Las Vegas Bullring. The $10,000 to win, 150 lap race is one of the premier events in the Western United States on the 3/8ths mile speedway October 20th. In 2018, Herzog competed at Kern County Raceway Park twice for Jefferson Pitts Racing. In the Winter Showdown, Herzog finished 13th. He returned in March for the NASCAR K&N Pro Series, West where he finished eighth. The 2019 edition of the $30,000 to win classic is February 2nd at the half-mile state of the art facility in Bakersfield. The Clovis High School student is in the midst of a great MAVTV-televised championship battle at Madera Speedway while also looking towards a future of traveling to larger races. The events in Bakersfield and Las Vegas attract great media attention and fan and industry support, making them vital for Herzog’s young career. Additional sponsors and supporters are needed to make the program a reality. Race fans can watch Austin Herzog in action on MAVTV, Thursdays at 5pm and 8pm Pacific time. Round #4 of the RPM Mortgage Pro Late Model Series airs August 30th. Monroe, WA - Fortune shined on Derek Thorn Sunday night at Evergreen Speedway. The veteran driver didn't lead the NAPA Auto Parts 175 until lap 116 when Derek Kraus ran out of fuel while leading. Kraus had led every lap of the race up until that point. Cole Rouse came home in the second position in spite of a crash in qualifying that forced him into a backup ride and a starting position at the rear of the field. Ryan Partridge, Thorn's teammate placed third but was disappointed in the speed of his car. Of course, nobody was as heartbroke as Kraus was. His fuel issues knocked him three laps behind the leaders in ninth place at the finish. The top five finishing positions were completed by Kody Vanderal and Tyler Tanner. Hailie Deegan, Matt Levin, Kraus and Trevor Huddleston finished sixth through 10th. With the victory, Thorn was able extend his lead in the championship standings by six points giving him an advantage over Partridge. Rouse is third, 34 points back followed by Kraus who is 36 back. 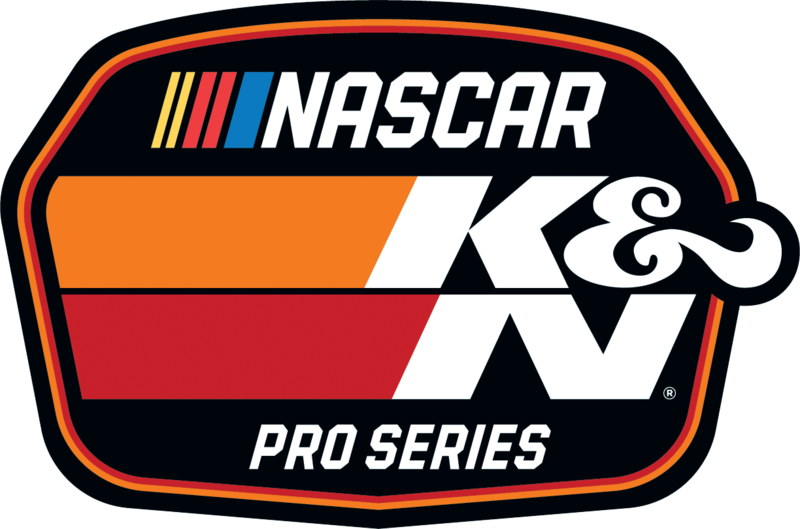 The NASCAR K&N Pro Series West has a week break before team make the trek east to Gateway Motorsports Park for the Monaco Cocktails Gateway Classic presented by West Coast Stock Car Hall of Fame on Friday, August 24. 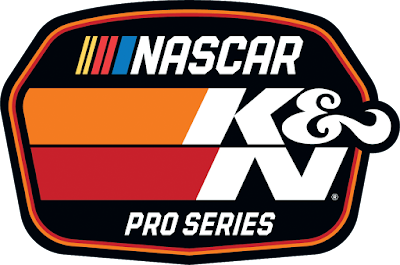 The race is the second and final of the two combination races between the K&N East and West Series, the previous having been at Iowa Speedway on July 27. 1. (2) Derek Thorn, Lakeport, CA, Ford, 175 laps, 61.016 mph. 2. (4) Cole Rouse, Fort Smith, Ark., Toyota, 175. 3. (3) Ryan Partridge, Rancho Cucamonga, Calif., Ford, 175. 4. (8) Kody Vanderwal, LaSalle, Colo, Ford, 175. 5. (6) Tyler Tanner, Auburn, Wash., Ford, 175. 6. (13) Cole Keatts, Lewiston, ID, Ford, 175. 7. (7) Hailie Deegan, Temecula, CA, Toyota, 175. 9. (1) Derek Kraus, Stratford, Wis., Toyota, 172. 10. (9) Trevor Huddleston, Agoura Hills, Calif., Ford, 172. 11. (11) Nick Joanides, Woodland Hills, CA, Toyota, 121, accident. 12. (5) Todd Souza, Aromas, Calif., Toyota, 120, accident. 13. (12) Will Rodgers, Solvang, Calif., Ford, 120, accident. 14. (14) Takuma Koga, Nagoya, Japan, Chevrolet, 118, accident. 15. (15) Armani Williams, Detroit, Michigan, Ford, 64, overheating. Caution Flags: 3 for 21 laps. Lap Leaders: D. Kraus 1-115; D. Thorn 116-175. Standings: 1. D. Thorn, 382; 2. R. Partridge, 364; 3. C. Rouse, 348; 4. D. Kraus, 346; 5. H. Deegan, 327; 6. K. Vanderwal, 325; 7. T. Huddleston, 318; 8. M. Levin, 282; 9. T. Koga, 251; 10. W. Rodgers, 212.